Yoshifumi Saito (齋藤 義文) from the Division of Solar System Sciences at ISAS is PI of the JAXA sounding rocket experiment for GCI-Cusp. 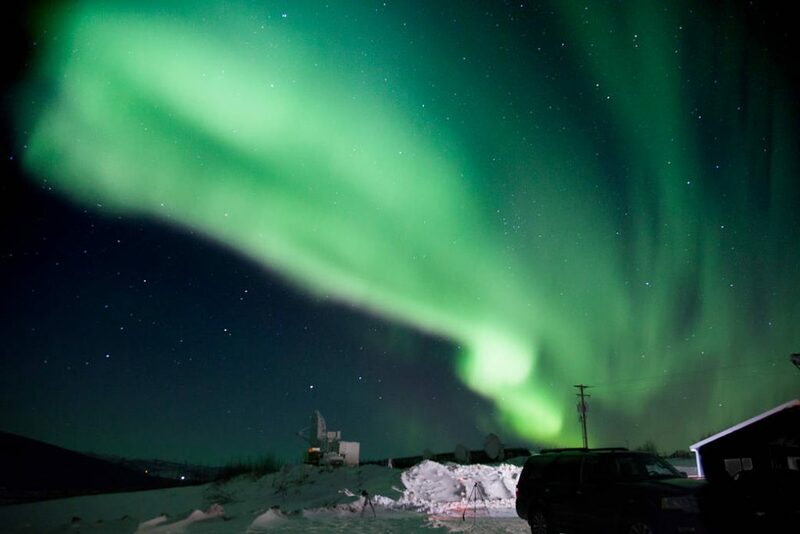 Travel to the high latitudes of Norway or Alaska or down to the southern lands of Stewart Island or the Falklands and you might be lucky enough to see the aurora. This stunning display of green, blue and pink lights in the sky is known as the Aurora Borealis when seen in the north and Aurora Australis when spied in the south, or simply the Northern and Southern Lights. The aurora is due to the interaction between the Earth’s magnetic field and the solar wind; a stream of high velocity particles emitted by the Sun. It is a phenomenon that has been known about for over a hundred years, yet the details remain elusive. These activities are important. Without our magnetic field, such winds could cause significant atmosphere loss and sterilise the planet surface. Solar storms that bring a heavier bombardment of particles can still pose a risk, disrupting navigation signals on Earth. Interactions with the planet and winds from the star therefore play a key role in planetary evolution and habitability studies. 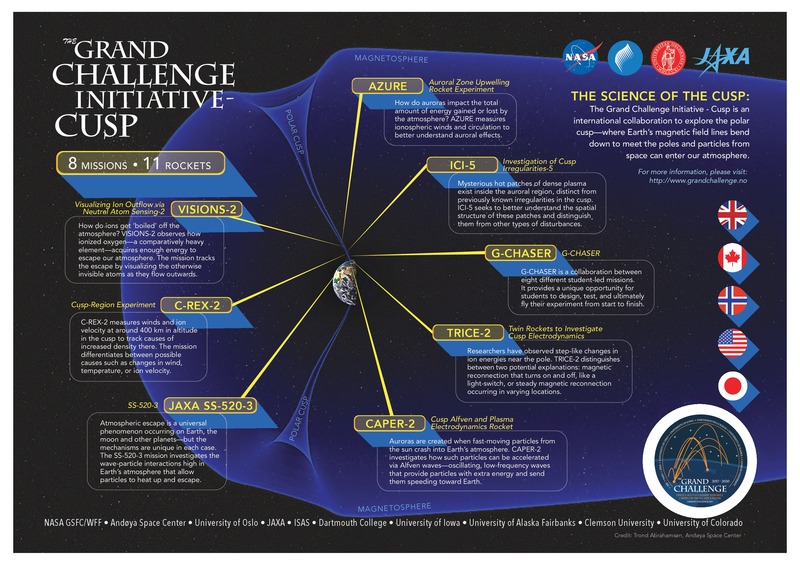 These wide-reaching implications has led to the “Grand Challenge Initiative (GCI) Cusp”: an international project to understand the interaction between solar wind and our magnetic field. GCI Cusp plans eight missions that will launch a total of eleven sounding rockets; small solid fuel rockets for making scientific measurements at high altitude. Sounding rockets do not go into orbit, but drop back to Earth after a short flight typically less than 30 minutes. The sounding rockets experiments are from teams around the world, with scientists from Japan, the United States, Norway, Canada and the UK all taking part. While most missions involve a single sounding rocket launch, one mission will launch four sounding rockets simultaneously; a first for sounding rocket experiments. 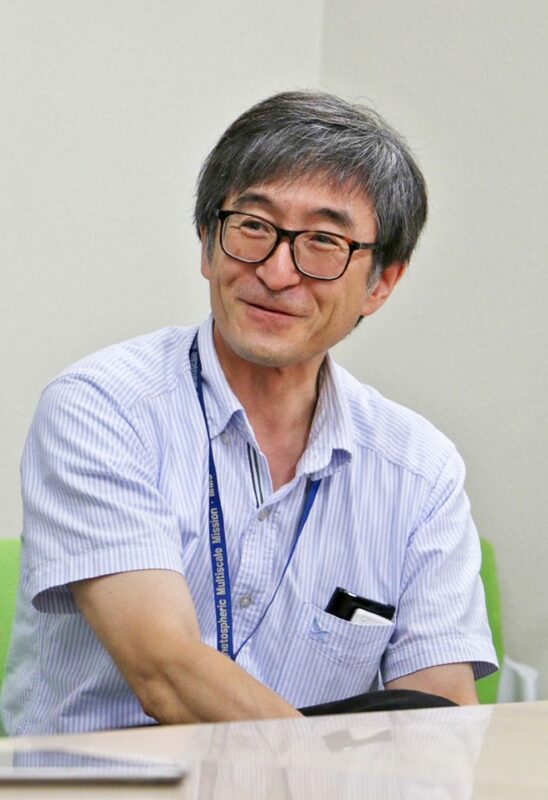 Yoshifumi Saito (齋藤 義文) is the Principal Investigator for the ISAS/JAXA mission which will launch the JAXA SS-520-3 sounding rocket. The rocket is 9629 mm in length with a 520 mm diameter. It will fly for about 20 minutes, reaching a height greater than 750 km; an altitude above the lowest satellites that orbit Earth. This short flight duration is both the advantage and disadvantage of sounding rockets. With a twenty minute flight time, the observation period for the sounding rocket is brief. On the other hand, the rocket can be launched quickly to catch transient phenomena such as the processes that drive the flickering aurora. By contrast, satellite orbits cannot be quickly or easily changed and their horizontal speed is much faster than that of a sounding rocket, making it tricky to catch short-lived events. The “cusp” part in the GCI Cusp project name refers to the section of the Earth’s magnetic field that the eleven rockets will study. To understand the importance of this region, it is necessary to take a closer look at what is happening when we see the Northern Lights. The Earth’s magnetic field wraps around the planet like a doughnut, with the central hole corresponding to where the magnetic field lines dip inwards towards the planet at the magnetic poles (tilted 11 degrees from the Earth’s rotational axis). Isolated from any external fields, our magnetic field would be cylindrically symmetric about the planet. However, the solar wind is imbued with the Sun’s magnetic field. Where the solar wind meets the Earth, the wind and planet magnetic fields combine in a process called “magnetic reconnection” and our doughnut-shaped field is distorted. The resulting combined field around the Earth compresses the dayside magnetic field in the direction of the Sun and draws the nightside field lines into a tail. The shape of the magnetic field lines now resembles long hair being pulled back in a strong wind. Originating from the hot plasma of the Sun, the particles within the solar wind consist of negatively charged electrons and positive ions of hydrogen (hydrogen atoms that have been stripped of their lone electron). Charged particles feel a force in a magnetic field that confines their path to the magnetic field lines. The solar wind particles therefore join the magnetic field around the Earth as the wind and planet fields combine, but are largely deviated around the planet. This particle by-pass route prevents our atmosphere being stripped in the high speed wind from the Sun. 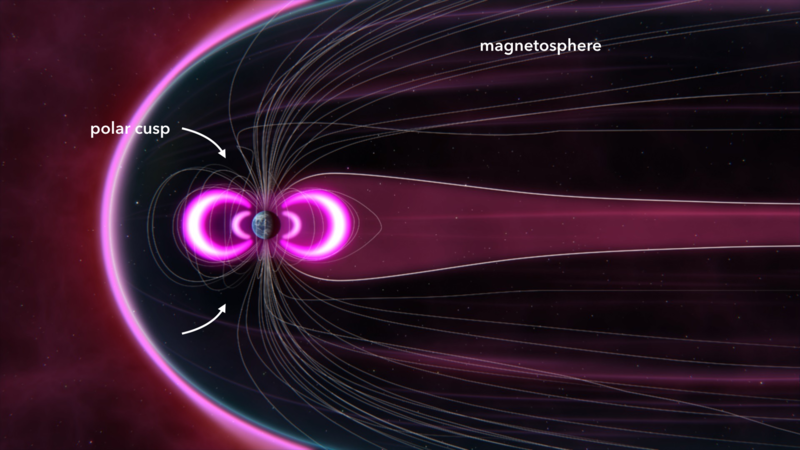 Solar wind particles can reach our atmosphere if they follow the reconnected magnetic field lines that extend down to the poles. These hit molecules in the air and cause them to emit light. This is the aurora. While most people think of the aurora as a nighttime event, there is actually a second aurora that occurs during the day. Particles in the solar wind that are caught on the compressed magnetic field lines that face the Sun can travel to the poles to meet the atmosphere on the dayside of the planet. This produces the daytime aurora. Conversely, particles that are channelled past the planet can be trapped in the extended tail of the magnetic field. This field tapers as it extends from the Earth before closing the loop and releasing a powerful amount of energy. The result is like snapping an elastic band and particles on the field line are slung back towards the poles on the nightside of the planet, creating the more familiar nighttime aurora. While visually exciting, the creation of the aurora is not the only interesting outcome of the interaction with the solar wind. Between the compressed dayside field lines and the stretched nightside field lines is a gap called the “polar cusp”. With the magnetic field bending away in both directions, the cusp is a region of weak magnetic field where the solar wind can penetrate deep into our atmosphere without being diverted by the field lines. Surrounding the cusp at the magnetic field boundary is the daytime aurora. But within the cusp, there seems to be an atmospheric leak. The upper atmosphere of the Earth is known as the “ionosphere” and extends from roughly 60 km to 1,000 km above the Earth’s surface. Ultraviolet rays from the Sun strike atoms at this high altitude causing them to become electrically charged ions, creating a plasma (a medium of ions and electrons) and giving the atmospheric region its name. It is the ionosphere within the cusp that seems to be flooding into space. 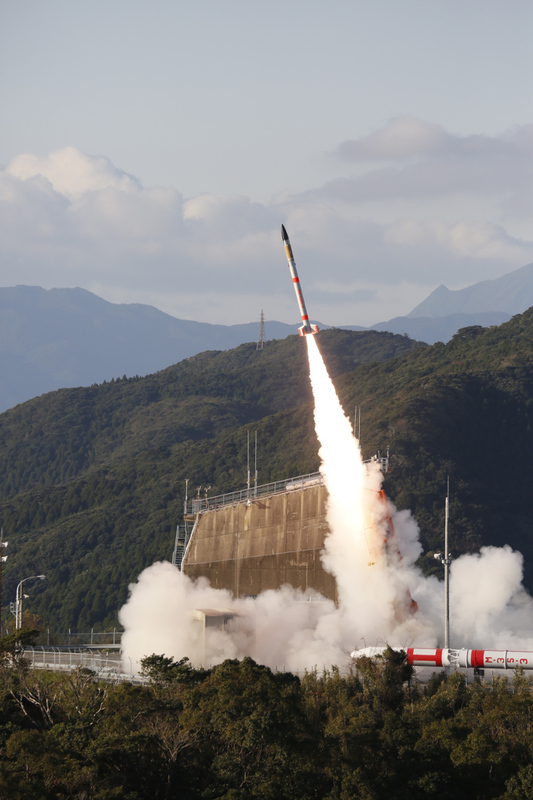 A JAXA SS-520 sounding rocket (unit 4) launching from Uchinoura Space Center. This loss is connected with the penetration of the solar wind into the cusp which drives waves in the ionosphere plasma that heat and accelerate the ions. With a higher velocity, the ions can then escape the Earth’s gravitational pull. The result is not a significant loss that will harm our planet, but it is a mechanism with a baring on planet habitability. “Previous observations have taught us that the escape of the ionised atmosphere is a universal phenomenon that occurs not only on Earth, but also on other planets including Venus, Mars and Mercury,” explains Saito. “But the escape mechanism differs. Understanding these various mechanisms is indispensable for understanding the history and evolution of planetary atmospheres. The boundaries of the Earth’s magnetic field and the injected energy from the solar wind make the cusp a complex place. This makes understanding exactly how this atmospheric escape valve works a tricky problem. While all eight sounding rocket experiments in the GCI Cusp project will focus on the cusp, the JAXA SS-520-3 rocket aims to explore how energy is exchanged between the waves driven in the ionosphere plasma by the solar wind, and the ionosphere particles. The rocket is equipped to observe the cusp with the “Wave Particle Interaction Analyser” (WPIA) for about 6 minutes at the apex of its flight path, which is able to measure the energy exchange between the waves and ions. At the same time, ground-based observations will be made of the cusp and aurora. The sounding rocket missions begin this year, with our SS-520-3 project team hoping to launch in 2019 or 2020. Many of the launches, including the JAXA SS-520-3, will be from the far northern latitudes of Svalbard in Norway, with the rocket data transmitted to multiple stations on the ground to ensure nothing is lost. Winter days in Svalbard are as dark as night, so the red glow of the daytime aurora may be visible to the launch teams. The Norwegian launch is familiar ground for Saito, whose extensive experience with sounding rocket missions begins with developing one of the mission instruments for his masters degree. The instrument flew on the first sounding rocket ISAS launched from Norway in 1990 and Saito used the collected data to write his thesis. Results from each of the eleven rockets will be shared with all members of the GCI cusp team, bringing together a huge pool of information that will undoubtedly reveal a great deal about how planets keep their air.